On Saturday, March 19th, The Source by Wolfgang Puck will launch its new dim sum brunch menu, offered every Saturday from 12 p.m. to 3 p.m. The dim sum menu will replace the existing Saturday brunch menu and will be offered in the restaurant’s bar and lounge area. Priced at $30 for five plates, $40 for eight plates, diners will have ample variety from which to choose, including General Tso’s Wings, Chow Fueng Noodles with rock shrimp and Lobster and Shrimp Spring Rolls. Several dishes will feature Drewno’s rendition of bao buns including Sweet roasted bao buns filled with pineapple custard, Duck bao with lacquered duckling and Char Sui bao stuffed with slow-braised veal cheeks. The menu will also feature a variety dumpling dishes including Szechuan “Dan Dan” dumpling with chicken and peanut sauce, Crystal chive dumpling with King crab and Chinese mustard and Sea scallop Sui Mai with curried lobster emulsion. Guests seeking more traditional flavors will enjoy The Source’s Maryland Crabcake Benedict, Kobe beef hash with poached egg and potatoes and Maine lobster club with bacon vinaigrette. All dim sum can also be ordered a la carte for $7 a dish. Complementing the tasty bites is an impressive selection of sweet and savory cocktails such as Pear Bellinis, Pimm’s Cups, Pomegranate Mimosas and three different kinds of Bloody Marys – a Classic Mary with horseradish and olives, a District Mary garnished with a housemade half-smoke and an Old Bay rim, and a Shanghai Mary with chili paste and lime juice. All brunch cocktails are $8 per drink. 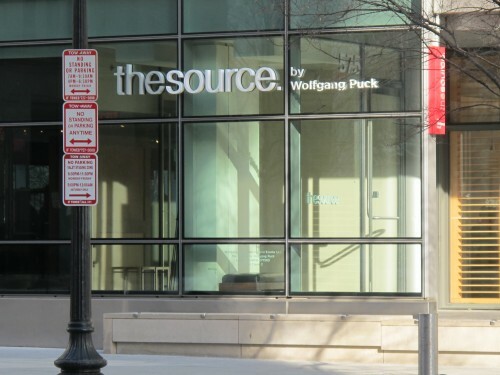 The Source by Wolfgang Puck is located at 575 Pennsylvania Avenue, NW (entrance on 6th Street). We judged The Source back in Jan. ’11.